This sleek black and granite-look Avanti Compact Kitchen combines a sink with an antique brass faucet and splashguard, two cooktop elements, a compact all refrigerator with a platinum finish door, and storage cupboard into one practical unit. The included refrigerator offers two adjustable/ removable slide out shelves, an adjustable thermostat, a crisper with glass lid, and a reversible door that can hold two 2-liter bottles. The cooking elements are rated at 500 and 900 watts and are set in a granite-look cooktop surface. The separate storage cabinet holds 2 storage shelves. 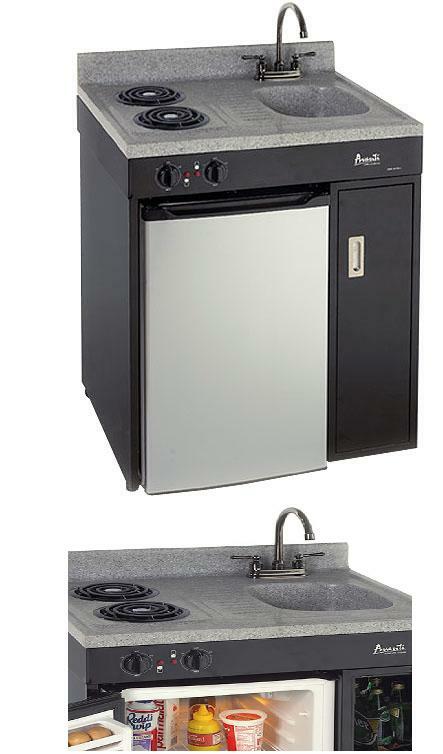 A great place to store beverages and snacks or make a homecooked meal, this compact kitchen is ideal for apartments, offices, dorms, and anywhere space is limited.